Tartan Week in New York – a week-long celebration of Scottish heritage. During Tartan Week lots of Scottish events and activities are organised throughout the city, the highlight of which is Tartan Day. Tartan Day is known for its parades of bagpipe bands, Highland dancing and other Scottish-themed displays. America is home to around six million people of Scottish descent: who celebrate just as enthusiastically as their kin in Scotland on their own Tartan Day. In New York, Tartan Week is even known to rival March’s extravagant St. Patrick’s Day. The 6th of April is the official Tartan Day, which commemorates the signing of the Declaration of Arbroath in 1320: Which was used as a basis for the American Declaration of Independence. Tartan Day was introduced ‘to recognise the outstanding achievements and contributions of Scottish Americans to the United States’. The day is about celebrating all that is good about Scotland: its people, its history, its heritage, its culture and its legacy to the world. When is the Tartan Day Parade? The Tartan Day Parade takes place on the closest Saturday to Tartan Day itself. 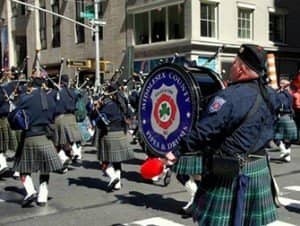 2019’s Tartan Day Parade in New York will take place on Saturday the 6th April from 14:00. 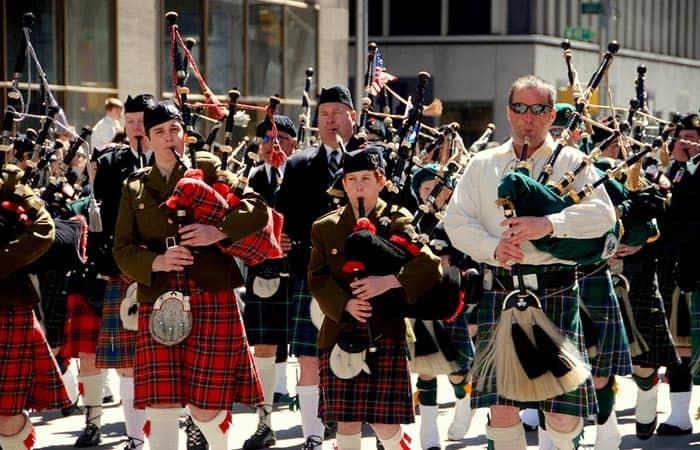 In 2019, the 21st Annual New York Tartan Day Parade is on the 6th of April at 14:00. The Parade starts on 45th Street and moves up 6th Avenue to 55th Street. Hundreds of bagpipers and drummers in bands from all over America join the parade. They wear traditional Scottish dress and march with their clans, associations, societies and even some Scottish Terriers! It’s a big event led by a Grand Marshal. During the parade, thousands of participants march their way up 6th Avenue, whilst throngs of New York spectators show support along the route. If you want to start the celebrations before the parade, head to one of the city’s pubs or bars. There’s even a ‘pub crawl’ the week before the parade. The starting point is St. Andrews Pub and Restaurant (140 West 46th Street) in Midtown. What else can you expect on Tartan Day? Between the 6th and 8th of April 2019 you can also visit on Ellis Island: at the Statue of Liberty / Ellis Island National Monument. Here, The Clan Currie Society, one of the largest Scottish heritage organisations in the US holds their annual celebrations. The free program includes pipers, drummers and highland dancers showcasing Scottish culture. Attendees of non-Scottish ancestry get a chance to experience the nation’s traditional music, drink, and tasty food.